I consider myself a pretty tough guy to impress. I’m really not interested in those unrealistic tuner cars that various manufacturers like Toyota show off; especially when the car under all those mods is Corolla or something of that nature. I’m not into sound systems, 24″ chrome wheels or anything like that as well. With the absence of any exotic cars (except for the very awesome, yet conservatively styled LFA) and only a handful of well known everyday sports cars, there wasn’t a whole lot for me at this years show. 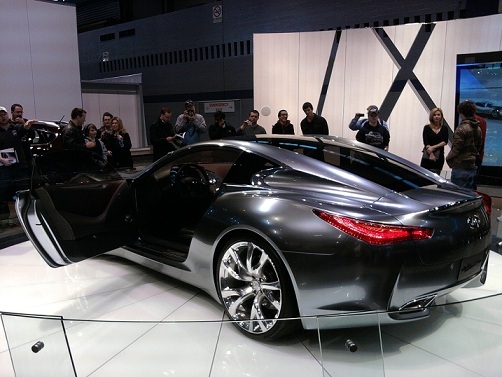 But then there was the Infiniti Essence concept car. I do not particularly like concept cars since they can also be very unrealistic. Just by looking over the ‘specs’ of this concept you can see what I mean. 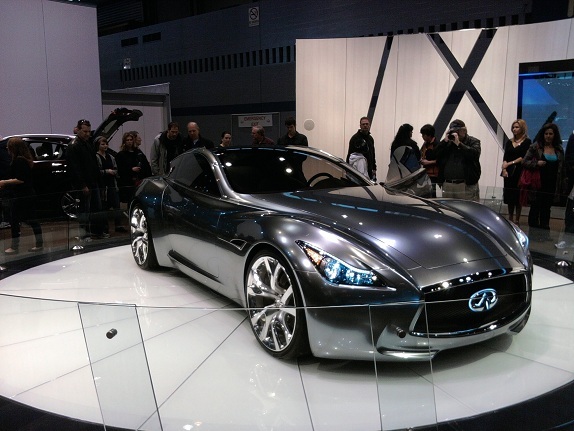 The Infiniti website says it has 592hp and is a gasoline/electric hybrid. Although its not impossible to have this kind of power as this output is similar to the Porsche 918 Spyder, its obvious that Infiniti wont be making something like this especially when they don’t disclose anything about a powertrain. But I really like the concept from a design perspective. The car embodies the classic front-mid engine set-up and I find the very swoopy bodywork attractive. It reminds me of classic European sports cars like the old Jaguar XKE and maybe some Aston’s from not too long ago (and right now). From a performance perspective, the wheel base looks a little long to provide quick handling and that glass roof is just going to add all kinds of weight. But other than that, the car is pretty subdued and doesn’t have any concept-only features. The interior of the car also deserves mention. It was hard to get a photo of it since I could not get close to the car, but the interior was rather simple yet very elegant. The Essence has a single gauge cluster and a very wide contoured center console unlike anything I have seen before. It was also simple enough where I could see this design being production worthy. Even though the Essence might be doable since I could see them using the 370z platform as a base, I doubt Nissan/Infiniti will be making another high dollar sports car since they already have the GTR. 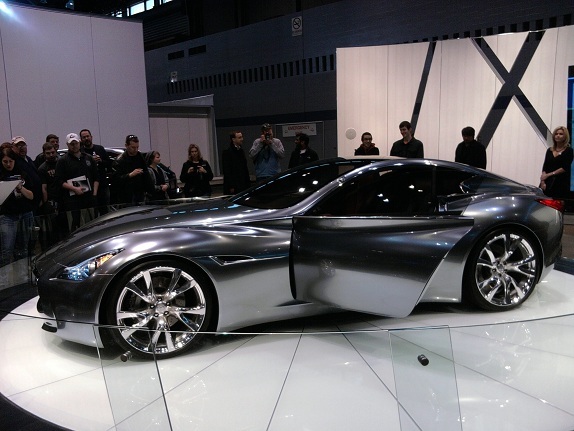 Concept cars are either design experiments to gauge public reaction or to show the design direction of the brand. But I don’t see this car really doing either. Takashi Nakajima, Design Director for Inifiniti had this to say about the concept: “Let me put it like this, the concept study primarily has a purely symbolic character, created to communicate the essence of what Infiniti aims to be on a global base.” Somehow, I don’t think the level of sportiness this car conveys is appropriate for the Infiniti brand; and I think the only thing we are going to see from the Essence in future Infiniti cars are very limited design cues. And that’s why I really don’t like concept cars. They are just such a tease! 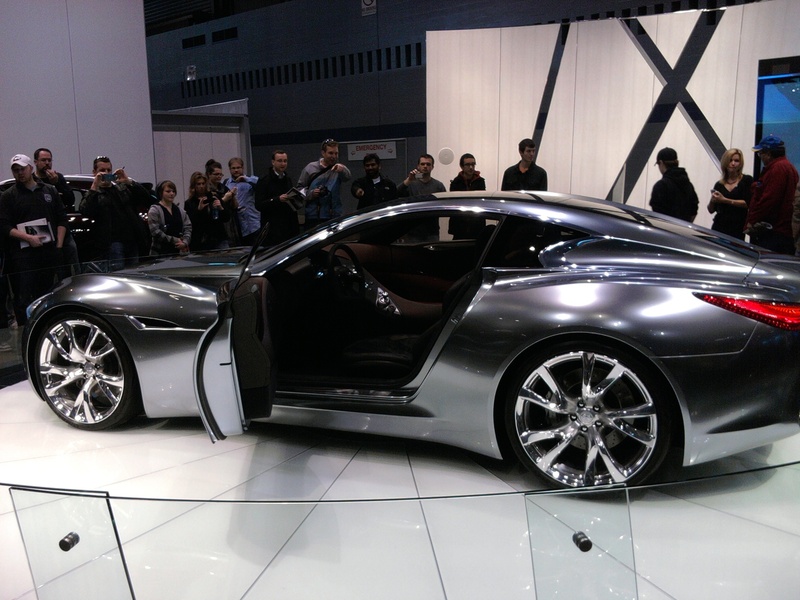 2 Comments to "2011 Chicago Auto Show report"
Any new prod cars worth mentioning? Nothing I saw at the show was too new and that’s why I didn’t mention any of that. Of course there is the yearly updates to current cars, but I don’t see that as a ‘new’ car. I guess the exception would be the Chevy Volt which they were giving test drives in; but you know I’m only interested in high performance cars! Plus the line to get in on that was very long…. « New Lamborghini Aventador video!